Computer-Assisted Bacterial Systematics examines the theoretical basis of numerical taxonomy and its impact on microbial classification and identification. In addition to the principles of numerical taxonomy, computer-assisted identification and the stability of classifications are discussed, along with cladistics and the evolution of proteins. The impact of computer-assisted methods on the systematics of different bacteria and on the description of microbial populations in natural habitats is also considered. Comprised of 16 chapters, this book begins with an introduction to the origins of modern numerical taxonomy, with emphasis on the collaboration between P. H. A. Sneath and R. R. Sokal as well as the controversy concerning optimality criteria in numerical taxonomic research. 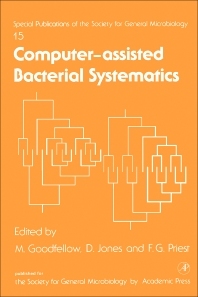 Subsequent chapters deal with cladistics and the evolution of proteins; computer-assisted analysis of data from cooperative studies on mycobacteria; numerical analysis of various types of chemical data using multivariate statistics; and the value of non-hierarchical methods in bacterial taxonomy. The final chapter considers the future of numerical taxonomy and the shape of things to come. This monograph will be of interest to students, practitioners, and researchers in fields ranging from microbiology to biochemistry and bacteriology.